While famous to most of the world for his seminal roles in Hollywood's earliest martial arts movies, Bruce Lee was known to many a celebrity as a brilliant teacher. Celebrities who trained with Bruce Lee spoke highly of his skill and temperament; even to this day, most Bruce Lee apprentices still commend the legendary actor and his teachings. Each of them tells different stories of Lee's prowess and the profound effect he had on their acting careers and their own lives. Despite being a relative newcomer to the Hollywood scene, Lee trained among the biggest stars of the era. Celebs who were taught by Bruce Lee ranged from the late Sharon Tate to the towering Kareem Abdul-Jabbar. Included below are some of Lee's most recognizable students, a few of which owe much of their career longevity to his training. In fact, three of his top students (Steve McQueen, James Coburn, and George Lazenby) served as pallbearers at Bruce's funeral when he died at the early age of 32. All of them understood a world prematurely robbed of Lee's teachings was a world robbed of a great talent far too soon. Known back in the day for his role in the 1960 mega-hit, The Magnificent Seven, James Coburn began training with Bruce Lee during his study of far eastern philosophy. "The perfection he achieved was awe-inspiring," explains Coburn. "He was the fastest moving person you've ever seen." The couple used to workout at Lee's place where he had a 700-pound punching bag on his patio. "He would kick that thing and double it over," Coburn recalls. "I would kick it, and it would double me over." When Coburn showed Lee his new 100-pound punching bag, Lee remarked it looked a little too hard for Coburn, saying he'd soften it up. His flying kick to the bag actually broke the 75-pound chain that it hung from. Over the course of five years, the two trained often with each other. "I'd have to go away on location sometimes," Coburn explains, "but each time I came back I was astonished to observe how Bruce had evolved even further. The steps he had taken were really giant steps." The apple never falls far from the tree, and such was the case in both life and death for Lee's son, Brandon. Groomed since childhood to be a master martial artist like his dad, Brandon could shatter wooden boards with a side-kick by age five, Bruce's brother, Robert, explains. "Bruce would hold [the board] like that...and say 'c'mon Brandon, do it with a killing instinct," Lee recalls. "And he would run right to the board and kick it with a side-kick and break it." And like his father, Brandon died unexpectedly at the beginnings of his burgeoning film career. Rumors of a curse and gang-related activity circulated after his fatal accident on the set of The Crow (1994) where he was accidently shot. He was only 28. Production was taking longer than usual, investigators found, and "both dummies and blanks... had hastily been fabricated by taking out the gunpowder from real bullets because of the time pressure crew members were under." It resulted in a "hideous fluke" when the lead tip of the bullet managed to perforate Lee’s navel at the stem of the aorta. Bruce Lee and Chuck Norris's epic fight-to-the-death scene in the Way of the Dragon (1972) was just as mental as it was physical. They spent a good two-and-a-half minutes 'prepping' for this fight, while the infamous cat watched. The cat, by the way, was used to mimic Chuck Norris's way of toying with Bruce, whom we all know, wins the fight. In fact, when Lee reached out to Norris about filming Way of the Dragon, he said didn't just want to beat the world champ, he wanted to kill him. The two spent a large amount of time working out together, punching and kicking and beating up on that good 'ol bag all martial artists learn to love. And when the time came to choreograph the fight in the Way of the Dragon, it was more of a meeting of the minds. "It was a mental thing between he and I," Chuck Norris explains. "That made it work... it was all the little nuances that made the fight." Bruce Lee truly fought from the grave when he squared off with basketball star Kareem Abdul-Jabbar in the 1978 film, Game of Death. For all you Bruce Lee fans out there, you might wonder how this came to be with his passing six years before the film's debut. 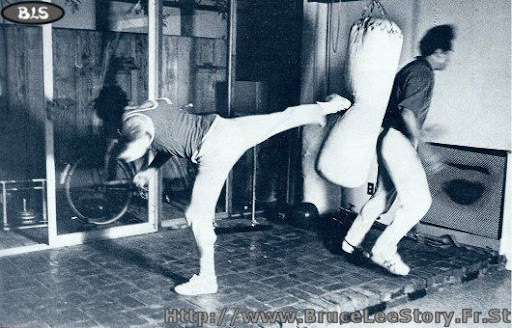 Prior to his death, Lee wrote an outline for the script and filmed a few of the fight scenes. In a classic fight scene, a yellow track-suited Lee takes on a seven-foot tall kung-fu demon, played by Kareem Abdul-Jabbar, and wins. "Working with Bruce...came about due to the fact that I worked out with him in training in martial arts," remembers Abdul-Jabbar. "Having an opportunity to do a movie with him... we both thought it was a great idea. We both jumped at it." Rumors surrounding Lee's death swirled when news became public. Lee had ruptured a disc in his back while lifting weights with Abdul-Jabbar one night. "In fact the doctors said they didn't know if he would be able to walk again or not," Chuck Norris explains. The medication he took later for back pain would lead to his death.